Find out when the best time to sell your home actually is. You want to sell your home, maximize the amount you sell it for and get it sold in a reasonable amount of time. While there’s no horrible time of the year to sell your home, there are better times of the year to put a home on the market to get the best results for yourself. We’ve done the research and the results are in. 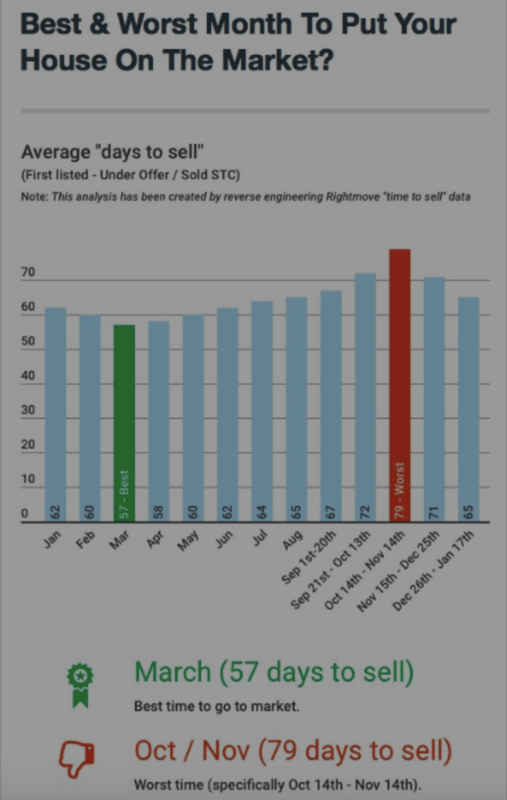 Here’s the best time of the year to sell. Life happens and sometimes, you just don’t have a say as to when you need to move. Children are born and you need more space. New jobs are obtained and you have to move to another part of the country. Marriages happen and you need a new place that represents both husband and wife. With that said, if you have the opportunity to control when you’re going to sell, there are better times of the year to put your home on the market to sell. As you review the data that we’ve shared below, it’s important to remember that the season of the year is only one factor that can impact the price of a home and the time it takes to sell. There are several other economic factors at play like interest rates, supply, demand, new construction in your area, schools, political influences, etc. that can impact pricing and timing. Other than that, with all things being equal, Spring narrowly edges out winter as the best time of the year to sell. As you can see, spring offered the best chance of selling above list price and of selling within 30 days. Upon closer inspection, you can also see that winter, expected to be the slowest season in which to sell a home, was a close second. Overall, 18.7 percent of homes sold for above asking price in the spring. Not far behind, winter listings secured the second spot at 17.5 percent. At the same time, 48.0 percent of homes listed in spring sold within 30 days and 46.2 percent of homes in winter achieved the same results. Granted, there may be fewer buyers looking for a home in the winter, but the folks who are out in the colder weather happening in most states are far more serious buyers. Most buyers looking to purchase a home during the winter are doing so out of necessity rather than desire. Consequently, they are much more likely to make a solid offer on a home and want to close quickly…exactly what we’re looking for from a motivated buyer. In addition to that, there’s significant reduction in the number of people who actually put their home on the market in the winter (27.3% less) versus the spring. Clearly, spring time experiences an onslaught of new listings to the market, making it harder for a listing to stand out. With so many fewer sellers listing in the winter, your home can shine for the serious buyers who are out looking to make a deal. Just as surprising is the information pertaining to homes listed in summer and fall. Folks who were looking to selling quickly and capture a better-than-full-price-offer achieved their goal less often. Autumn listings were 21.4% less likely to sell over list price and 14.7% less likely to sell in in 30 days or less compared to spring. Autumn can get a little weird in the real estate market in general. In the early part of autumn, people are trying to squeeze last minute vacations in before school starts. After that, well, school starts and people are trying to get into their back-to-school rhythm. Then, as fall ends and we hit winter, the holiday season approaches and lots of folks put their home selling and home buying plans on hold until the new year. As a rule, the final quarter of the year is not ideal if you want to sell your home for top dollar and close quickly. Interestingly enough, as we turn the corner into January, the numbers indicate that time on market starts to shorten and prices starts to increase. Even in areas where it’s cold, snowy and often bleak, home shoppers get out and look for homes in January and February. The folks in this part of the country are used to the snow, sleet, wind and blustery cold. Plus, these areas of the country have good plowing and winter weather management strategies, making it easier for motivated buyers to get out shortly after a storm to buy a home. As with all things in life, it’s rarely a good idea to make a decision for yourself based simply upon conventional wisdom. Always do your research and get the real numbers that apply to your specific situation. If you’d like access to a local market information here in our area, click here and let us know how we can help you..
Also, you can click here if you’d like to find out what your home will sell for in today’s market. When You Deserve the Best, Experience Matters.